Isn’t Jerusalem already Israel’s capital? Why is this an issue? Do any other countries have embassies in Jerusalem? What did President Trump do yesterday and what does it mean? Why did Trump make this decision? What is the local reaction and what does this mean for our friends on the ground? What we can all be doing to help in light of what happened yesterday? International Equities: In 1947, when the United Nations recommended dividing the Holy Land into two states—one Jewish and one Arab—it recognized the multiple equities and religions in Jerusalem and designated it as a “Corpus Separatum” to be governed by an international body. This never came into being, but it did set the stage for the international response. Divided City: After Israel’s creation, the city of Jerusalem was divided. In 1949, the new Israeli state controlled “West Jerusalem” and made it its capital. But “East Jerusalem,” including the historic Old City, was under Jordanian occupation. 1967 Reunification and Israeli Occupation: After the 1967 War, Israel’s military took control of (occupied) the West Bank, including East Jerusalem. It expanded East Jerusalem’s boundaries from about 7 square kilometers to over 70 and applied Israeli law there. And in 1980, Israel formally annexed the area—making it part of Israel. The world rejected this attempted annexation as an attempt to acquire territory by force, something prohibited in modern international law. East Jerusalem is therefore still considered to be an occupied area. Negotiations and Palestinian Claims: Since 1967, the reality on the ground has changed and it is now fair to presume that parts of East Jerusalem will likely become part of Israeli Jerusalem in any future peace agreement. In 1993, when the Oslo Peace Process began, Jerusalem was designated as a “final status issue” by Palestinians, Israelis, and the international community. Because Palestinians have long claimed East Jerusalem as their capital, the world has withheld recognition of Israeli claims to the city until the larger dispute is settled. Jerusalem’s demography: Nearly 40% of Jerusalem’s residents are Muslim and Christian Palestinians. They have a unique status that must be resolved. While they are technically eligible for Israeli citizenship, most only have status as permanent residents. Neither do they have citizenship from the Palestinian Authority, placing them in a tenuous legal state despite being in the city of their birth and ancestry. Bottom Line: Jerusalem is a unique place where many religious and international interests converge. Historically, its final status has been left to be determined as part of a resolution to the broader conflict. In the meantime, East Jerusalem, which Palestinians claim as their capital, is regarded as occupied. Currently, no country has an embassy in Jerusalem. A few nations have consulates in the city, including the US, whose office functions as a diplomatic mission to Jerusalem (as an international city) and to the Palestinian Authority. The US’s embassy to Israel is in Tel Aviv. At different points in time, 16 countries have had embassies in Jerusalem. However, in 1980, Israel’s Knesset passed a law making all of Jerusalem—including the Eastern portion that Israel occupied in 1967—the “complete and united capital of Israel”. The UN Security Council then passed resolution 478, condemning the move as a violation of international law and called on member states to close their embassies in Jerusalem. Most did so immediately. Trump formally recognized Jerusalem as the capital of Israel. The administration’s explanation for this move is that it is just a recognition of current and historical reality. However, the US will still consider the final borders of the city unsettled until its final status is negotiated as part of an agreement between Israeli and Palestinian leaders. …Trump will sign a waiver allowing for a delay in the embassy’s move to Jerusalem. This waiver applies to a law passed in 1995, which initiated and funded the move of the US embassy from Tel Aviv to Jerusalem. According to the law, this move must take place by 1999 or Congress would withhold a portion of the State Department’s funding. Because the law could be criticized as a Congressional infringement of the executive branch’s Constitutional power to shape and implement foreign policy, the framers wrote in a provision allowing presidents to waive the law every six months if they believed moving the embassy could pose a threat to national security. Every six months since the law passed, presidents have signed this waiver. Trump will sign the waiver to maintain the State Department’s funding while the embassy is moved. Trump claimed that acknowledging Israel’s right to determine its own capital is a “necessary condition to achieving peace,” but made no reference to a similar right for Palestinians, or any sort of strategy to achieve a peace agreement. The Ultimate Deal: President Trump framed this move as part of his attempt to achieve “the ultimate deal” between Israelis and Palestinians. Some supporters of the move argue that this not only strengthens US influence on Israel, but puts more pressure on the Palestinians. President Trump’s explicit statement that his announcement would not impact a future final status agreement could be seen as an effort to maintain the possibility of negotiations. And Trump’s appeasement to a major Israeli position could garner him the political capital to make future concessions from Israel that would be necessary for a successful peace deal. Domestic Politics: The administration is framing the decision as a “recognition of reality” and the fulfillment of a campaign promise; acting on something that prior presidents have promised but failed to deliver. This rhetoric points to domestic politics and an appeal to Trump’s base as the driver for yesterday’s announcement. The Evangelical Christian Zionist part of Trump’s base is likely to strongly support and gain energy from the Trump administration’s decision.But the Brookings Institution argues that Trump’s base is not likely to abandon him even if he does not follow through on this particular campaign promise. The chief Palestinian negotiator, Saeb Erekat, told Haaretz following the announcement that “the two-state solution is over. Now is the time to transform the struggle for one-state with equal rights for everyone living in historic Palestine, from the river to the sea.” PA President Mahmoud Abbas said that he would not recognize Trump’s decision and that the US could no longer function as mediator in peace talks. Three days of ‘rage’ were called for by Palestinian leaders, with Hamas leadership calling for a third intifada. In Bethlehem the lights on the town’s Christmas tree were switched off in protest. In Israel, reactions were mixed. At the leadership level, Prime Minister Netanyahu called it an “historic day” and images of the Israeli and American flags were projected onto Jerusalem’s old city walls in honor of the decision. He invited other nations “that seek peace” to follow America’s lead by recognizing Jerusalem as Israel’s capital and moving their embassies there. In East Jerusalem, many are warning of an increase in protests and even violence. The Washington Post reported that shops in Jerusalem’s old city were shuttered. Some clashes broke out between Palestinian protesters and Israeli border police in East Jerusalem, Ramallah, and Gaza. One East Jerusalem resident described the situation as a “time bomb”. There is the very real threat of a return to the cycle of violence and the daily insecurity this brings to our friends in Israel and Palestine. US Legitimacy as a Mediator: Trump’s announcement will likely do serious damage to America’s ability to serve as mediator in the Israeli-Palestinian conflict. President Abbas even said that the Palestinians will no longer accept the US in this role, though given America’s involvement on the ground, it will be difficult and costly to ignore. Critics in the Arab world have long argued that the US’s close relationship with Israel precludes it from being a neutral mediator and Trump’s announcement plays into this narrative. Israel and the US have repeatedly vetoed United Nations resolutions that would give Palestine full member status in the organization on the grounds that Palestinians were trying to circumvent the peace process. This action by Trump can easily be interpreted as a US action that circumvents the peace process. Future Negotiations: While Prime Minister Netanyahu declared Trump’s move as a “step towards peace”, one Palestinian leader said that the “two-state solution is over” and that Palestinians would now commit their effort to achieving equal rights in one state that would grant them access to Jerusalem. The loss of the two-state solution would put the prospects for peace in unchartered territory. Since the foundation of the modern state of Israel, the two-state solution has been the only legitimate option on the table. Any alternative raises serious questions about Palestinian freedom and sovereignty, and about Israel’s existence as a Jewish democracy. Foreign Policy Strategy: Announcing Jerusalem as Israel’s capital does not appear to serve any sort of strategy related to Israel/Palestine or the broader Middle East. Trump’s Israel/Palestine strategy so far has involved attempts to improve relationships between Israel and the Arab world, through which he might improve the relationship between Israeli and Palestinian leaders. Announcing Jerusalem as Israel’s capital would damage any progress that the administration has made in this effort. Turkey, for example, has threatened to cut diplomatic ties with Israel over Trump’s announcement.Most world leaders, analysts and media outlets believe that this decision will likely derail any credible effort to achieve an ultimate deal and may permanently harm America’s regional standing. The Palestinian representative to the United Kingdom told the BBC that Trump’s move would be a “kiss of death” to the peace process and many Palestinian and Arab leaders are now saying that this announcement essentially forecloses the possibility of a two-state solution. The US played a significant card that cost them credibility with Palestinians and across the Arab world, they say, without receiving anything in return from Israel. Additionally, this move threatens another of the administration’s policies: containing Iran. Achieving any success in building a coalition to counter Iran’s growing influence in the region was made more difficult by the White House’s announcement. Saudi Arabia, for example, had appeared to be maneuvering into a closer relationship with Israel because of Iran, but yesterday, called Trump’s actions “unjustified and irresponsible”. Keep your eye on the prize: In other words, keep perspective. The first abolitionists knew that there was little to no chance that they would see an end to slavery in their lifetimes. But had they not put their egos aside and begun acting and speaking in hopeful, subversive ways, the anti-slavery movement would not have grown. Movements take time to grow. Sometimes generations. We don’t need another hero or savior. We need good people of good will who are willing to do the right thing. So stay focused on the goal: Getting America, a key influencer in this conflict, to support security, dignity, and freedom for all Palestinians and Israelis. Share your experience with friends and family. Tell of your time in Jerusalem and of the inspiring and difficult realities you encountered there. 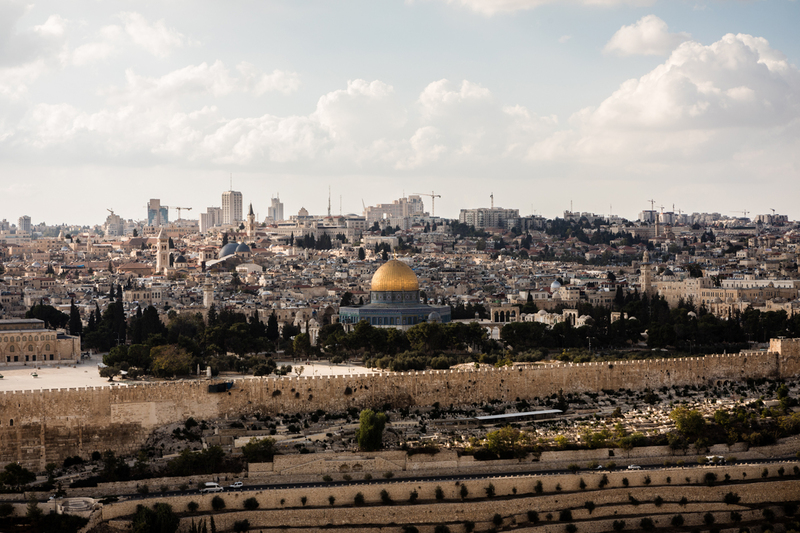 Speak to Jerusalem’s potential as a beautiful model for multi-faith, multi-ethnic cooperation. Consult our Share Your Story Guide for advice on how to do this. Friends, conversations around the dinner table or over the holidays might be uncomfortable. But they are necessary. I know we so often want to avoid discomfort, but the world is heading into dangerous times. We can stay silent and unengaged; or we can find a deep and sturdy courage to actually dive more deeply into relationship with those we love. The future will be uncomfortable no matter what. We must together dive more deeply into the practices of peacemaking so that we can help form communities of peacemakers. Invite your skeptical friends and family on a trip with Telos. Or just open a conversation in which you model pro/pro/pro. Ask questions and listen more than you speak. But remind your loved ones: there is much more to the story than they may have heard. Click here for our guide to help you navigate these tricky—but necessary—conversations. Engage your community and political leaders: Invite your church, synagogue, mosque, or school on a learning trip to the region. Host a speaker or a film. Email info@telosgroup.org for suggestions. Go and ask your representative or their staff, who are home for winter recess, what they’re doing to protect all residents of Jerusalem. Share your story with them and let them know, lovingly, that there is a growing community of vocal peacemakers committed to a pro/pro/pro peacemaking and an equitable resolution to this conflict. Remember your Palestinian and Israeli friends: Send a note and/or a donation. They need to know that you’re working to change the conversation here so we stop acting so irresponsibly over there. And they need our support. Consider organizations that are seeking to help Jerusalem sing in all its voices: groups like Terrestrial Jerusalem, Musalaha and so many others. To that end, consider giving to Telos to help us build the pro/pro/pro community in the U.S. Your support will help ensure that domestic politics no longer leads to dangerous decisions such as the one we saw yesterday.